The SafeTower from StorDigital Systems is at the cutting edge of duplication equipment, and when you look at its features, build quality and value, it’s easy to see why! This clever device is able to add copy protection to all your DVD Video discs, which prevents someone from unlawfully copying your work. The device comes with 5 free licenses, which allows you to protect 5 different DVD Video master discs. Once you've protected a master disc, you can make as many duplicates of that disc as you like, and every single copy will have its own DVD-Video protection. The in-built SATA drives offer the highest achievable speeds around for DVD and CD burning, all of which are easily controlled on the duplicator with the touch of a button. The intelligent control centre burns to all 10 drives simultaneously, ensuring all your data is duplicated efficiently and cloned exactly as it should be. 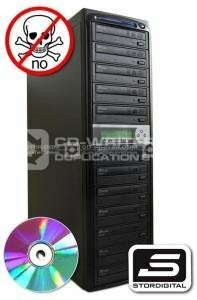 Designed as a dedicated duplication machine, the SafeTower operates completely independently, however a PC is required to add the protection to your original DVD Video Discs. That data is then transferred to the internal Hard Drive of the duplicator via a USB cable, and you can then run the unit as a standalone system. Why not upgrade the included 250GB Hard Drive to give you more storage space, or upgrade the system to include Lightscribe printing, the ink-free printing solution. There are a host of upgrades available to improve the capabilities, speed and performance of your StorDigital SafeTower even further, call our sales team on 0208 293 0777 for expert advice on your personal and unique requirements. Multi-Language capability: The text on the LCD screen can currently be displayed in English, Spanish, French, & Japanese. Continuous operation No need to stop the duplicator for fear of overheating. StorDigital . SafeTower . 10 . Drive . CD . DVD . Copier . with . Video . Copy . Protection . Systems .